February 17, 2016 - Bombardier and Air Canada execute letter of intent for 45 firm CS300 aircraft and options for 30 more CS300 aircraft. 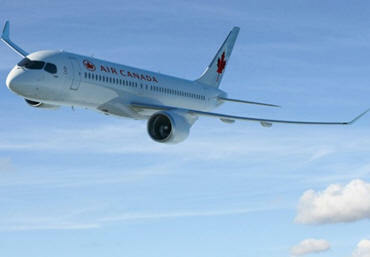 Air Canada to become the first North American mainline, international network carrier for the C Series aircraft. Bombardier Commercial Aircraft and Air Canada announced today that the parties have signed a Letter of Intent (LOI) for the sale and purchase of 45 CS300 aircraft with options for an additional 30 CS300 aircraft, which also includes conversion rights to CS100 aircraft. Based on the list price of the CS300 aircraft, a firm order for 45 would be valued at approximately $3.8 billion US. “We’ve been carefully assessing the capabilities of Bombardier’s C Series aircraft and its progress for some time and today we are very pleased to announce an agreement to acquire the CS300 for our mainline fleet,” said Calin Rovinescu, President and Chief Executive Officer, Air Canada. The C Series family of aircraft, representing the fusion of performance and technology, is a 100 per cent all-new design that offers operators up to US $13 million extra value per aircraft. By focusing on the 100- to 150-seat market segment, Bombardier has designed the C Series aircraft to deliver unparalleled economic advantage to operators and to open up new opportunities for single-aisle aircraft operations.